In this edition of the SA parkrun newsletter, we celebrate parkrunners across South Africa joining the 50 and 100 clubs, catch up with the Roodepoort Raiders and see the launch of two new parkruns at Pongola and Constantia Greenbelt. 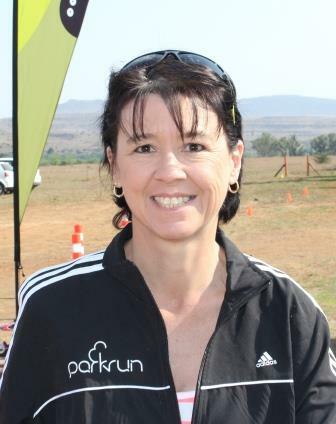 We also celebrate our parkrunner of the week, Melanie Nel from Aliwal North parkrun. By the time I write the next newsletter parkrun South Africa will be celebrating its 4th birthday. It is amazing to think that in four years parkrun’s numbers have swelled from 26 registered runners at one parkrun venue to 290,000 at 67 different venues. Perhaps even more astonishing is the fact that we now have a number of senior parkrunners who have almost completed 200 parkruns. In fact Tracy Rankin has run 200 parkruns and Dieter Meyer, Brian Thomas and Willem Loison are hot on her heels. The 200 mark is not celebrated with a special club Tee but by this time next year these 4 runners will become the first South Africans to wear the coveted 250 club shirt. While he may be quite a few parkruns behind these celebrated parkrunners in completed runs, Ari Serlis is no less committed. 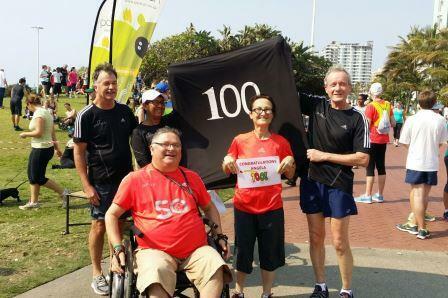 Ari is a prominent member of the 50 club at Durban’s North Beach and is considered one of the characters of the very popular parkrun. Because Ari uses a wheelchair he is also the only 50 club member to have his “50” emblazoned on the front of his shirt. We can’t wait to see you in the black 100 club shirt, Ari! I started the last newsletter in a slightly grumpy tone when I reminded parkrunners of the “No Barcode, No Result” rule. I need to complete my message with another reminder. We have had some reports of parkrunners and volunteers being rude to mountain bikers and other park users. I remind everyone that with the exception of one or two private venues we do not own our parks and nature reserves. parkrunners understand that we share these safe, traffic free environments with other park users and should try to be as courteous as possible at all times. In many cases park users get used to the fact that for an hour on a Saturday morning the parkrunners are “at it again” and they steer clear, or join in. But still we must be aware that our open areas are for everyone and they are not exclusively reserved for parkrun. Roodepoort parkrun is the second oldest parkrun in South Africa and has built a loyal and regular following, with upwards of 500 participants every Saturday morning. It is with great sadness that Roodepoort said goodbye and bon voyage to event director Philip Gray, who left for New Zealand last week. 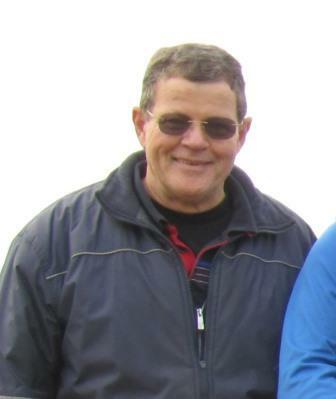 Keith Norman has swiftly stepped into the breach but we know that Philip will soon be making his event management skills available at a parkrun in New Zealand. It is one thing for the Kiwis to beat us at rugby but now they’re taking our best volunteers as well!! Roodepoort is also famous for the Roodepoort Raiders, a group of passionate parkrunners from Roodepoort who regularly “raid” other parkruns. There is no mistaking the Roodepoort Raiders; led by Keith “Kip” Norman, they are all 50 and 100 club members and they wear distinctive pink caps. They are also a boisterous and cheerful lot who are famous in SA parkrun circles. 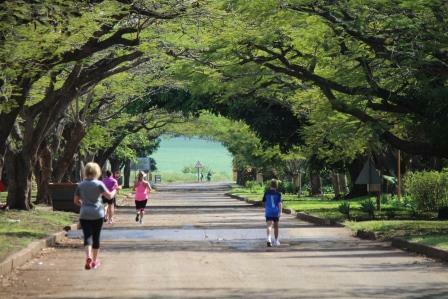 A fortnight ago KZN sugar cane country launched a parkrun in the Pongola sugar mill grounds. Zelda Ackerman is the event director at Pongola parkrun, which is run close to the Swaziland border. A small but enthusiastic crowd of locals were present to run on the flat, fast concrete road and grass path route. It was a typical KZN hot, humid day but the parkrunners were shaded by the avenues of tall, old trees which line the route. Pongola parkrun has a very unique old world feel and I look forward to running it again in the near future. 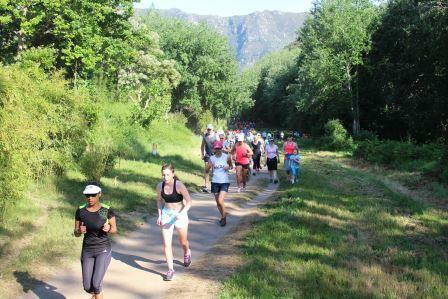 Last Saturday we launched Constantia Greenbelt parkrun on a perfect bright morning in Cape Town. 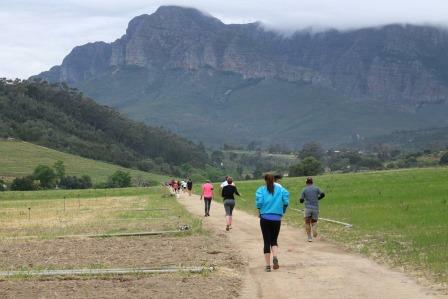 Over 500 parkrunners arrived to run the beautiful trail parkrun route through the trees and along the challenging paths in the shadows of Cape Town’s famous mountains. 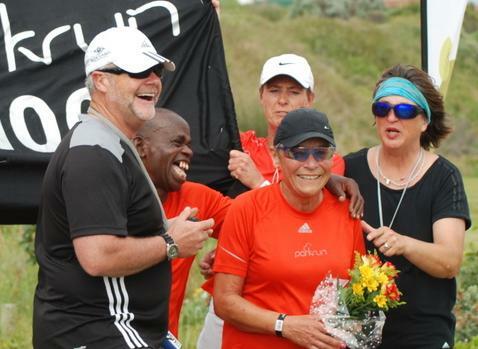 Mike and Rene Scott have assembled an enthusiastic group of volunteers and we have no doubt that Constantia Green belt will add its name to the list of most popular SA parkruns. 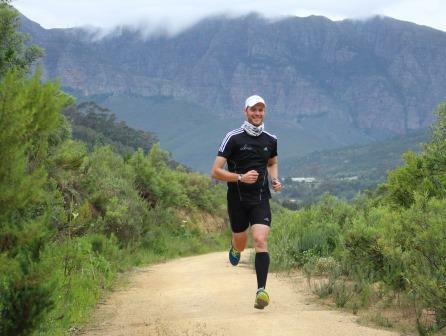 Rene is a highly successful triathlete and has won two gold medals in the Comrades marathon. She and Mike first approached us about starting a parkrun and contributing to their community earlier in the year at the launch of the Bellville parkrun. It is always good to see how one parkrun can inspire the start of another. If you have not heard, Discovery Vitality has launched a brand new benefit that is bound to keep you motivated and active on a regular basis. Vitality Active Rewards offers you weekly rewards like free drinks when you achieve the personalised fitness goal that is set for you. It’s simple – just download the latest version of the Discovery app and activate Vitality Active Rewards today, then hit the treadmill for tea-time on us! You can also invite four friends to join your Vitality Active Rewards team. If you and two or more friends in your team all hit your goals in a week, you’ll earn another reward! Reaching your fitness goals has never been this rewarding, so spread the word about this exciting new benefit. Saturday 24th October was a big day of celebration at St Francis parkrun when two of their parkrunners, Felix Muchika and Pam Stark ran their 100th parkruns, the first for St Francis to qualify for membership of the 100 club. Pam was also the first lady to have completed 50 parkruns and Felix the second male. To fit in with the parkrun tradition of being brought in with “the flag”, huge planning took place behind the scenes for this special day. Felix (VM60-64) always finishes in the top 3, so very few runners had seen him finish before – one of the privileges of being a volunteer is to see this “old man” dusting off the rest of the field. His fellow runner and employer Colleen Butler, and sister Yvonne Robb started their run shortly after 07:00 in order to be at the finish line with the new black flag to run the last bit with Felix. More parkrunners, especially the 50 club members, sacrificed their run (or walk!) to be at the finish line to cheer for Felix. On Saturday, Colleen and Yvonne, together with a small crowd, brought Felix in, who then turned back to fetch Pam so they could finish together. A larger crowd accompanied her to the finish. For a moment we were afraid that Pam thought she could keep the new black flag, as she picked it up and started to run back – to finish a second time with another large crowd next to her husband Mike! Event Director and timekeeper Eric Stewart had to focus quite hard to keep track of those who were actually finishing for the first time and those who were just joining in the celebration. We surely do it our own way in St Francis! It has been a while since we have provided you with an update on the parkrun Raiders, their achievements and shenanigans. 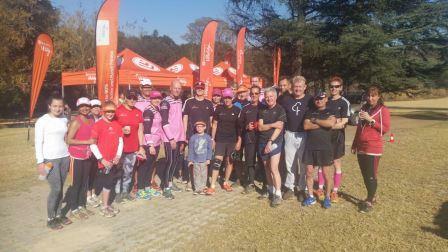 The parkrun Raiders were established shortly after the Roodepoort parkrun launched. We are a group of 11 – 77 year old parkrun tourists that “raid” an alternate parkrun in the Jozi and Pretoria areas every other week. The Raiders are mainly made up of Florida Running Club members; however there are members of other clubs such as Pirates, Golden Reef and Roodepoort who join us. We have a number of serious speedsters who regularly run a top 10 position at most parkruns. The rest of us, well we try to compete in our age categories! The parkrun Raiders are not all about “raiding” park runs. We recently presented you with a pink “Raiders” cap at the Golden Harvest parkrun during one of our “raids”. The significance of the cap is, it was made specifically for the Raiders, everyone paid a small donation for the cap and what did we do with the proceeds? With the proceeds and other donations we started fixing the derelict lapa at Len Rutter Park, thus ensuring that we had new toilets fitted, running water and proper ablutions. Mike Watts and George Karas were very instrumental in fixing up the lapa ablutions with the assistance of George Taylor, who has not raided with us yet. We will however drag him out soon. The lapa is now secured with metal shutters and a security fence, we have James the “minder” who now stays in the lapa and cleans up the park for us on a weekly basis. George Taylor is also instrumental in ensuring that the grass is cut regularly. When we held our second anniversary last year, Mike Megannon organized a tip and a gang of cleaners and the park was cleaned and spruced up for all to enjoy. The Len Rutter Park once boasted of a beautiful dam with swans and ducks, sadly the park has been neglected over the last number of years. We have a good relationship with the local councilor who approached us recently and planted some more trees along our route. Slowly but surely we are getting our park back. The Raiders all volunteer for parkrun duty at least once a month and some of us form a part of the Roodepoort parkrun core volunteering teams. Not only has parkrun has become a big event in our community on a Saturday morning, but a number of runners have started their “running career” on our hallowed turf. I just received my 50 parkrun t-shirt today and thought it appropriate to thank the South Africa and George parkrun teams for the great things that you guys are doing. parkrun has become a big part of my life and judging by the attendance that I see the same applies to many others. You are certainly making a positive and fun difference to the overall fitness of many in the SA population. Also thank you to the sponsors for making it all possible - the technology is particularly impressive. Thank you George parkrun team - you guys are the best! You run our parkruns in a highly efficient and friendly manner - thank you! My wife (of 31 years) recently completed and earned her red 50 parkruns shirt. In my haste to get her red shirt, as we were going to the UK and both wanted our red SA Flag branded “50” shirts – I made a cardinal mistake – I actually ordered a “50” shirt that is too small. After 30 years of the eternal question “Do I look too big / fat in this?” – I got it wrong. She collected her small size on Saturday and is really “grumpy” and she should have had a medium. – She has the shirt in its plastic bag unused. Is it at all possible to have this changed – just so she loves me again? PS: We ran the Barnsley Yorkshire parkrun in Locke Park – a magnificent park – on 26th September. I had my “50” shirt and a SA Flag Buff and Helen also had a SA Flag Buff We of course had to put up with a lot of “Yorkshire chirping” about the Boks and what had “jappened” the week before. Of course that night England went into mourning. PPS: My dog, Kandas – the sole reason the wife and I run – is now is almost at 100 parkruns. He is now a legend at Roodepoort Len Rutter Park. Loved by many runners who when they pass us always say “Hi Kandas!” No one notices me being dragged behind him! Most memorable or funniest parkrun moment: When one lady literally fell over the finish line in an attempt to get a PB. Why should others volunteer at parkrun? : It is helping the community to achieve a better lifestyle, so please volunteer. It is a lot of fun! What fellow volunteers say about them:: Melanie is our most dedicated volunteer. She has been there for us since the start of our parkrun. She completed 3 of our parkruns then unfortunately had to have a knee operation which did not stop her from volunteering on 10 occasions. In this edition of the SA parkrun newsletter, we remind parkrunners not to break the golden rule of parkrun, welcome Wellington parkrun into the family and hear about a parkrunner representing South Africa overseas. We also celebrate our parkrunner of the week, from Shongweni parkrun. I would like to apologise in advance if the beginning of this newsletter has a slightly grumpy tone but there are a couple of serious matters which need to be discussed. The first of these is that we have received some reports of volunteers being verbally abused by runners who have forgotten their barcodes and are insisting on having their details recorded and entered later into the results. This is completely unacceptable. Volunteers are the lifeblood of parkrun and no one should put these very generous people under pressure. We should always remember that volunteers give their time freely and generously so that we can enjoy our parkrunning. Of course, we do record the results of parkrunners who have brought their barcodes with them but the barcode scanner or barcode itself has failed to scan. The cardinal sin of parkrun is to forget your barcode and the rule remains in place all over South Africa and internationally; NO BARCODE NO RESULT. I would also like to remind parkrunners that only those who have completed the full 5km route will be credited with a result. Those runners who run a different or shorter route will not be added to the results. We are saddened and concerned that Nahoon Point parkrun in East London will be forced to move to a new venue because the Buffalo City council has suddenly decided to charge a fee for the use of the nature reserve through which the parkrun is run. Nowhere in the world are parkruns charged to help make citizens healthier, happier and fitter and we will not let this happen at Nahoon Point. It is sad that an impasse has been reached because Nahoon Point has been a wonderful parkrun, regularly attracting fields of more than 500 participants for over 3 years now. The Nahoon Point team is in negotiations right now and we are all hoping for a happy compromise. The recent heat wave has reminded us to remind you to bring your own water to parkruns. There are a few parkruns where volunteers supply water but we shouldn’t rely on these generous people. The hot weather hasn’t stopped speedster Stuart McColl from amazing us all. 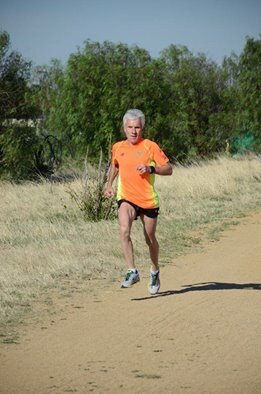 Stuart, who runs in the 60-65 year category, recently ran 16:45 at the tough, high altitude Klerksdorp parkrun course, achieving an amazing age grade of 91.74%. 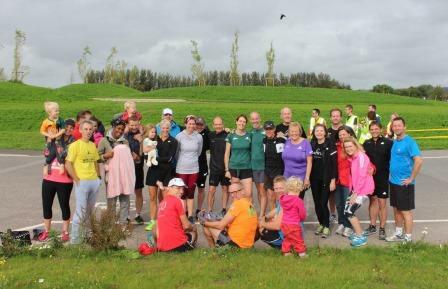 We recently welcomed Wellington parkrun to the South African parkrun family. 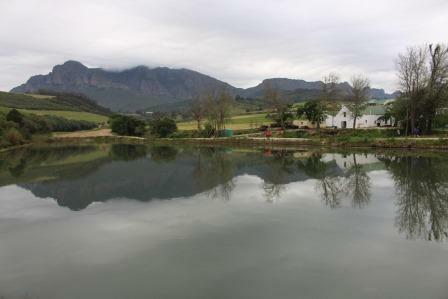 Cherona Vlok and Francois Coertze and their team have created a beautiful parkrun in Imbuko vineyard, in the shadow of the Bainskloof Mountains. 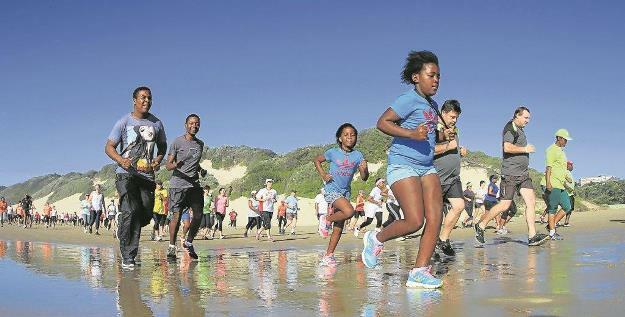 Everyone agreed it is one of the most beautiful parkruns in South Africa but visitors be warned it boasts its own tough “Chapman’s Peak” hill at 3 ½ kms. This Saturday we will launch Pongola parkrun, close to the Swaziland border in Northern KZN. Zelda Ackerman has designed a route in the local sugar mill grounds. It is a fast, flat route lined by sugar cane fields and accompanied by steamy KZN humidity which has been eagerly anticipated by the local community in Pongola. Discovery Vitality brings you fun rewards and more! With so much excitement happening at Discovery Vitality, here are just two things that we’re sharing with parkrunners this week. Vitality Active Rewards offers you weekly rewards like free drinks when you achieve your personalised fitness goal. Simply download the latest version of the Discovery app, activate Vitality Active Rewards, achieve your personalized fitness goal and get a FREE drink. Terms and conditions apply. Your kids can share in the Disney magic if they sign up for the Discovery Duathlon Kids Event on 24th October. The kids can “let it go” as they run through Frozen winter wonderland, look for Nemo in the bubble tunnel, and run with the Good Dinosaur as they get closer to the finish line. For more information and to enter, visit www.discoveryduathlon.com. A regular at Laudium parkrun, Matthew Greer, a grade 10 pupil at Sutherland High School, was chosen to represent the South African Modern Pentathlon Association (SAMPA) at the 2015 UIPM Biathle World Championships in Georgia on 22nd September. Being his very first international race, Matthew had no idea what to expect and was extremely nervous before the race. However, after the start gun set them off, he had a fantastic race (1500m run, 200m swim, 1500m run) in a very strong field of competitors and was able to keep in touch with the front group. Matthew executed a perfect race and finished in a very credible 6th place, only a couple of seconds off the winner. Within the individual race there was also a team competition, where the total time of the first three competitors from each country is used. Matthew, with his 2 team members from South Africa, had the fastest overall time and this earned them the gold medal for the best team in their age group. Matthew is now on his way to Australia to represent South Africa as a junior elite athlete at the Duathlon Championships. These will be held in Adelaide on 17th October, where he will have to run 5km, cycle 20km and run 2.5km. 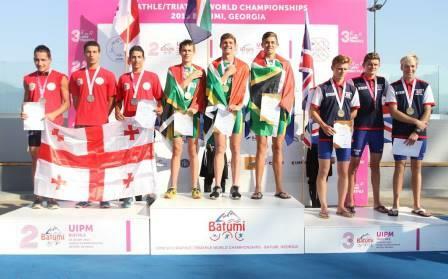 At the age of 16, Matthew will be the youngest athlete to represent South Africa at this event. 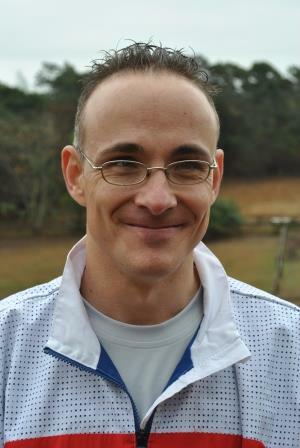 parkrun South Africa wishes Matthew the best of luck at the championships. How has parkrun changed your running: My fitness has increased and I have become a much stronger and faster athlete because of Shongweni parkrun. What do you like about parkrun: Giving back to my community and fellow athletes and helping them to achieve their goals at parkrun. Most memorable or funniest parkrun moment: Our 1st birthday run, to see the support from all the athletes and parkrun community was amazing, that was also the most participants we had ever had and knowing that it will grow in numbers was rewarding. Why should others volunteer at parkrun? : parkrun is a family and it is so rewarding to volunteer and know that you have given back and helped others . The only goal at the end of the day is to make our parkrun a success, Shongweni parkrun is only as good as its volunteers; without them it would not happen each and every Saturday. What fellow volunteers say about him:: Jason is definitely a "favoured son" with his support of parkrun at Shongweni - he has taken something like 50,000 photographs and one of them featured in a recent Modern Athlete article on parkrun. It is usually Jason who is first out with the mallet every Saturday as the banners and funnels are established. We are looking forward to seeing him complete many more parkruns! Keep the camera batteries charged, Jason! In this edition of the SA parkrun newsletter, Bruce reports from the parkrun country managers’ conference in Ireland, we take a look at which dogs can and cannot complete a parkrun, as well as celebrating our parkrunner of the week from Hartenbos parkrun. 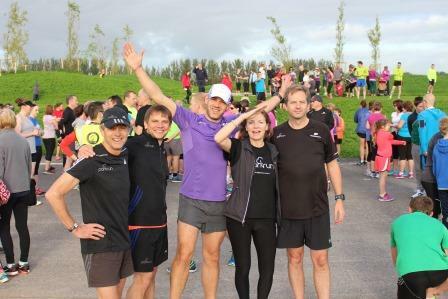 Gill and I have just returned from a parkrun country managers’ conference in Cork, Ireland. It must have been one of the most motivating and exciting 5 days I have ever experienced. The future of parkrun global is truly mind boggling and we all left feeling proud and privileged to be part of such a special movement. And parkrun is a movement. Already parkrun is the biggest running event in the World. Last Saturday 112,000 parkrunners participated at over 700 different parkruns around the World. In South Africa alone over 17,000 parkrunners ran and walked at 63 venues around the country and unlike the World’s major running events parkrun takes place 52 times a year. Perhaps even more significant than parkruns running statistics are those of its volunteers. Worldwide more than 10,000 volunteers gave up their time to help parkrunners enjoy their Saturday morning. This they did without thought of any reward other than the occasional handshake, friendly “thank you” or hug. Clearly there is a magic ingredient in parkrun which elicits the best in people. It wasn’t all work at our conference and we broke at times to run along Cork’s beautiful River Lee and to take in a couple of World Cup rugby games in local Irish pubs. Thank goodness the Springboks won their game against Samoa or life would have been unbearable at the conference. Of course all work stopped on Saturday morning so that we could run a parkrun and we were fortunate enough to run the inaugural Tramore Valley parkrun in a beautiful park that used to be a rubbish dump landfill site. Tramore Valley Park is an outstanding example of the creative and sustainable use of a formerly ugly polluted area. It’s a fast parkrun too and Gill was delighted to run a lifetime p.b. (26:35) on the two lap course. We were running in beautiful autumn weather in Ireland but we soon learnt of the heatwave that has hit much of South Africa this last week. Obviously we all have to be wary of running in hot weather but we also have to be look after our four-legged friends. Sadly a dog died of heat exhaustion at one of our parkruns on Saturday. For this reason in this newsletter we have included a letter of advice for dog owners at those parkruns which allow dogs. After a quieter time in September we are now about to get busy launching a few parkruns around the country. On Saturday Wellington parkrun will join the SA parkrun family. 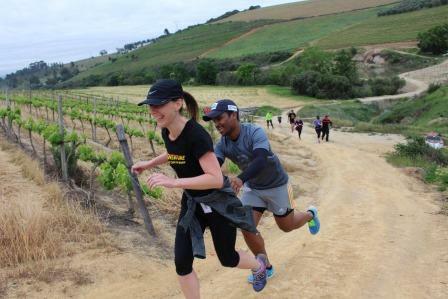 The parkrun route winds through the lovely Imbuko wine Estate and event directors Francois Coetzer and Cherona Vlok have warned parkrunners to beware of the steep hill at halfway! Join us for a #RUNCYCLERUN through Sandton on 24 and 25 October, for the first-ever Discovery Duathlon. The unique urban #RUNCYCLERUN format of the Discovery Duathlon offers a challenge not only for experienced athletes, but also for any sporting enthusiast. If you can run 5 km, you can do the Discovery Duathlon! The weekend offers fun for the whole family – even your kids can join in the fun on 24 October. If you are a Discovery Vitality member, you’ll earn up to 5 000 Vitality points for completing the race and if you belong to Team Vitality you’ll get up to 50% cash back. Team Vitality members also stand a chance to win awesome Duathlon kit worth R50 000! All they need to do is enter today and they’ll go into our lucky draw. Entries close at midnight on 8 October. Look out for more information coming soon. Terms and conditions apply. Exercise for a dog should be a way of life but it is necessary to be aware of some important facts before taking your pet with you. - Make sure your dog enjoys running – watch how they react because they will tell you – be aware and sensitive to what they are saying. - Dogs want to please their owners, so when a dog shows signs of stopping take it seriously. - Start with play sessions of 30 – 60 minutes and short, local loops before you take them to a parkrun. - Watch for signs and be receptive to your dog’s cues – YOUR DOG KNOWS WHAT IT NEEDS. - Communicate – talk to your dog – tell them they are going for a walk so that they can stretch and drink. - Running in a group can be distracting – introduce them slowly to feel comfortable with a large group of people. - Talk to them whilst walking to calm them down if they are anxious about faster runners passing them. - Make sure that there is always clean water available for them to drink, especially in hot weather. - Carry plastic bags for their poo. That is another responsibility you choose to take on if you bring your dog running. - They should have consistent exercise during the week – they can’t just be taken to do a 5 km parkrun when you feel like it – they need training just like you. - Dogs don’t need to wear jackets in winter when running. - Puppies do not have the muscle tone to run long distances – they must finish growing before they can run long distances. - Play and go on shorter walks with your puppy because they need training … but NOT walking or running 5 km. - Small breed puppies can run 1.5 km at a slow pace from the age of at least 8 months. - Remember, your puppy will tell you when they are ready to stop – listen and do not push them beyond their own limit. - Large breed puppies only stop growing between 18 and 24 months. If you run them too early their bones and joints will be damaged for life. - Train your puppy to be prepared for parkruns – all ages, bicycles, strollers, cars and leads. Thank you to the vets and nurses at Bryanston Veterinary Hospital for reading and editing this information. How has parkrun changed your running: I was just starting to become running fit when I hurt my back and as a result am unable to run (or walk the distance at speed). I enjoy the events so much that I decided to contribute in a way that still allows me to participate while not putting strain on my back. I can't wait to get running again though. Most memorable or funniest parkrun moment: I took a photo of one of the ladies during a wet race. She was totally bedraggled with rain and sweat pouring down her face, clothing stuck to her body. Honestly, she was a sight to behold - but for the wrong reasons! The next week it was fair weather and she was all nicely dressed again, hair all in the right place. As I took the photo she asks "Lyk ek beter vandag" ("Do I look better today"). Of course I said "Yes". For the next few weeks she kept asking me the same question - and I gave the same answer. It became a standing joke between us. Why should others volunteer at parkrun? : The parkrun is a very well-run event. It is enjoyed weekly by hundreds of people. The track is well laid out, well-marked and an absolute pleasure to run on. Participants just need to turn up with their barcodes. Everything else is done for them. Without the volunteers however, you have nothing. So it's very simple: no volunteers, no parkrun! What fellow volunteers say about them:: Gerold is so dedicated - He cannot participate as a runner, but volunteers every single week. After an eye operation he couldn't wait to get back on the volunteer team. He is a truly passionate parkrun volunteer. We are proud to have Gerold on our team.